Enjoy the same precision control of our Growmaster Procom in a single zone environment with our Growcom system. We have packed the most common environmental control equipment in use in a single zone control system. The Growcom can also be used with our Growlink Windows®-based software. A zone temperature sensor, as well as a solar sensor, come standard with the Growcom. 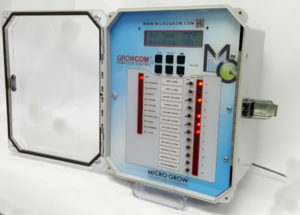 The Growcom features four separate daily operation modes including DIF. Low voltage 24 VAC operation.